But a more important clock, registering the thoughts and feelings in our hearts, spiritually prepared us for the meeting that we are beginning today of young disciples of the Master of Nazareth from all over the world. I welcome you all most cordially in the city of Karol Wojtyła – Saint John Paul II. It is here that he grew up to serve the Church, and it is from here that he set off to the ways of the world to preach the Gospel of Jesus Christ. I welcome you in the city where we especially experience the mystery and gift of Divine Mercy. 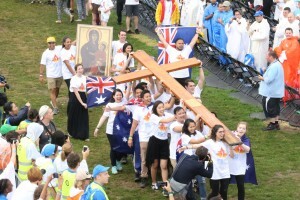 Pilgrims from the Archdiocese of Sydney carry the cross and icon during a procession at the Opening Mass at WYD. 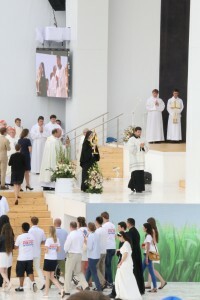 I welcome and greet all the cardinals, archbishops and bishops assembled in Krakow in large numbers, here at this Błonia Park sanctified by John Paul II and Benedict XVI, and to be sanctified by the presence of Pope Francis. I heartily welcome the official delegation of the Patriarchate of Moscow with the Metropolitan himself. 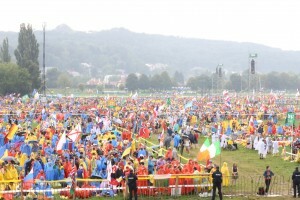 I warmly welcome the priests concelebrating this Holy Mass opening World Youth Day 2016 in Krakow. And with all of you, the participants of the Eucharist, I greet the youth all over the world and the people of goodwill. We would like to tell everyone that we wish to live in peace and we pray for peace in our turbulent world, we pray to stop violence and injustice, not to let anyone die of hunger. Let us pray for truth that we are brothers and sisters, because we are the children of one God. In merciful Divine Heart there is place for each of us! We pray during this Holy Mass for all the victims of the terrorists attacks. Let us pray for the priest who died today during the Eucharist in France. Brothers and sisters, let us open our hearts to receive the word of God and the gift of the Eucharist. May the crucified and risen Lord, the saviour of the world, stand among us. Let us commend to Him all our thoughts and feelings, hopes and expectations regarding the festival of faith of the young church that is beginning. In this spirit we start the Eucharist. 1. Listening to the dialogue of the risen Jesus with Simon Peter on the bank of the Sea of Galilee, hearing the triple question about love and the answer to it, we have in mind the hardships of the life of this fisherman of Galilee that preceded this crucial conversation. We know that he one day left everything – his family, boat and nets – and followed an unusual Teacher from Nazareth. He became His disciple. He learned His way of looking at the matters of God and people. He lived through His passion and death, as well as through a moment of personal weakness and betrayal. Afterwards, he experienced a moment of astonishment and joy connected with Jesus’ resurrection, who appeared to His closest disciples before ascending into heaven. We also know the continuation of the conversation, or rather the trial of love that today’s Gospel speaks about. Simon Peter, strengthened by the Holy Spirit, became a brave witness to Jesus Christ. He became a rock of the emerging Church. For all this he paid the highest price in the capital city of the Roman empire – he was crucified like his Master. Peter’s bloodshed in the name of Jesus became the seed of faith and initiated the growth of the Church, which engulfed the whole world. Today, Christ speaks to us in Krakow, at the banks of the Wisła river, which flows through all of Poland – from the mountains to the sea. Peter’s experience may become ours and inspire us to reflect. Let us pose three questions and look for the answers. First, where do we come from? Second, where are we today, in this moment of our lives? And third, where are we going to go and what are we going to take with us? Where do we come from? We come from “every nation under heaven” (Acts 2:5), like those who came in great numbers to Jerusalem on Pentecost Day, but, looking from this place, there are incomparably more of us now than two thousand years ago, because we are accompanied by centuries of preaching the Gospel, which since then has reached the furthest ends of the world. We bring here our experience of various cultures, traditions and languages. What we also bring are testimonies of faith and holiness of our brothers and sisters, followers of the risen Lord, of past generations as well as the current generation. We come from such parts of the world where people live in prosperity and peace, where families are communities of love and life and where young people can pursue their dreams. But among us are also young people from countries whose people are suffering due to wars and other kinds of conflicts, where children are starving to death and where Christians are brutally persecuted. Among us are young pilgrims from parts of the world that are ruled by violence and blind terrorism, and where authorities usurp power over man and nations, following insane ideologies. Meeting with Jesus, we simultaneously realize that we all make up a great and magnificent community – the Church – which surpasses the boundaries established by people and which divide people. We are all God’s children, redeemed by the blood of His Son, Jesus Christ. 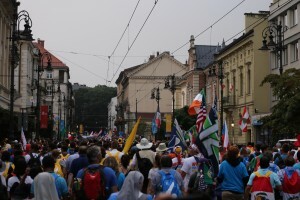 Experiencing the universal Church is a great experience associated with World Youth Day. The image of the Church depends on us – on our faith and sanctity. It is up to us to ensure that the Gospel reaches those who have not yet heard about Christ or have not learnt enough about Him. Tomorrow, the Peter of our times – Pope Francis – will arrive among us. The day after tomorrow, we will greet him in this same place, here at Błonia Park. In the following days, we will listen to his words and pray together with him. 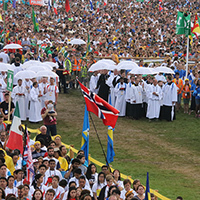 The presence of the Pope at World Youth Day is yet another beautiful and characteristic feature of this celebration of faith. And finally the last question: where are we going and what will we take with us from here? Our meeting will last only a few days. It is going to be an intense, spiritual and, to a certain extent, physically demanding experience. Afterwards, we will return to our homes, families, schools, universities and to our places of employment. Maybe we will make some important decisions during these days? Maybe we will set some new goals in our lives? Maybe we will hear the clear voice of Jesus, telling us to leave everything and follow Him? With what will we return? It is better to not anticipate the answer to this question. But let us take up a challenge. During these days, let us share with each other what is most valuable. Let us share our faith, our experiences, our hopes. My dear young friends, may these days be an opportunity to form your hearts and minds. Listen to the catecheses delivered by bishops, whom I sincerely thank for their engagement. Listen to the voice of Pope Francis. Participate wholeheartedly in the divine liturgy. Experience the merciful love of the Lord in the sacrament of reconciliation. Discover also the churches of Krakow, the wealth of the culture of this city, as well as the hospitality of its inhabitants and of those of neighbouring towns, where you will find rest after a day’s rigors. 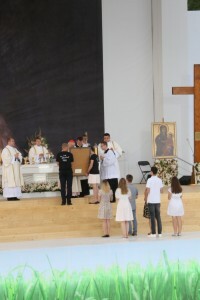 My dear, Krakow is alive with the mystery of Divine Mercy, also owing to humble Sister Faustina and John Paul II, who made the Church and the world sensitive to this specific trait of God. Returning to your countries, homes and communities, carry the spark of mercy, reminding everyone that “blessed are the merciful, for they shall obtain mercy” (Mt 5:7). Carry the flame of your faith and ignite with it other flames, so that human hearts will beat to the rhythm of the Heart of Christ, which is “a flaming fire of love.” May the flame of love engulf our world and rid it of egoism, violence and injustice, so that a civilization of good, reconciliation, love and peace will be strengthened on our earth. My dear friends, World Youth Day 2016 ‒ has just begun! Poland and Krakow are happy to have you. I would like to thank you for joy that you bring to our lives. You help us even more to experience happiness out of belonging to Jesus Christ and the Church community. Peter of our times, Pope Francis will come tomorrow. We welcome Him today! He will strengthen our faith and hope for the better future even more. I thank cardinals and bishops that they are with us, that they are with the youth in this exceptional moment for the Church. Let the Lord bless us! Let the Lord bless all the nations that are represented today in the city of Divine Mercy and Great Shepherd of the Youth, Saint John Paul II. I wholeheartedly thank all of you!